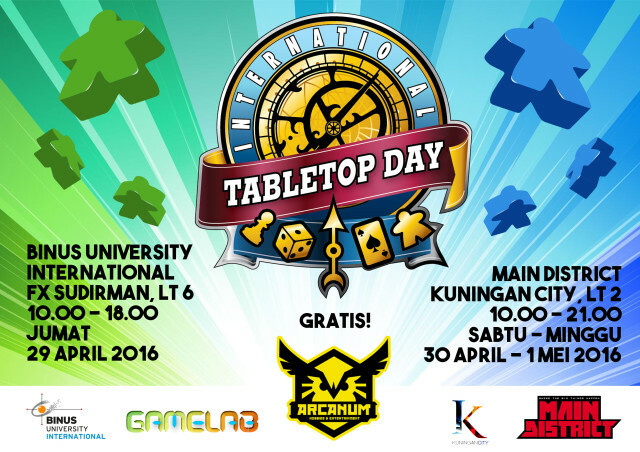 We proudly to announce that we’re holding International TableTop Day. Play Day: gather and play the boardgames together with people from all around the world that celebrate International TableTop Day. Prototype Day: game makers or game creator can bring their boardgames to be tested. Community: to gather various game community to try many boardgames. “The first International TableTop Day, founded by Boyan Radakovich, was held on March 30, 2013 and was live-streamed on the Geek & Sundry channel on YouTube. Games includedTakenoko, Ticket to Ride, 7 Wonders, Smash Up, and Star Trek Catan; with several of the first season guests returning to play. It aired in two segments hosted by Felicia Day and Wil Wheaton, with an extra wrap-up segment uploaded later. Events were held in 64 countries. The second International TableTop Day was held on April 5, 2014. The event was again live-streamed on YouTube, and the games shown were KrosMaster: Arena, Tanto Cuore,Rampage, and Love Letter. Events were held in over 80 countries.